I really hope that this story ends up working itself out! Los Angeles Times spoke with Sam Jackson and the famed actor told the newspaper that he may no longer be playing Nick Fury in Iron Man 2 or any later Marvel film for that matter! Talk about a kick in balls! I can't remember any other 30 second scene that created more anticipation or hype, ever! 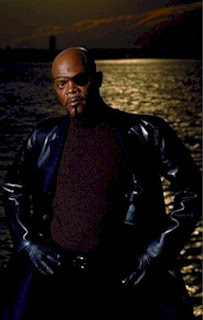 I idea of stripping Sam Jackson of his Nick Fury character seems absolutely idiotic! Jackson told the LA Times, "I saw ['Iron Man' and 'Iron Man 2' director] Jon Favreau at the Scream Awards and we had a conversation. He said, 'I hope things are working out for you because we're writing stuff for you.' Then all of a sudden last week I talked to my agents and manager and things aren't really working that well." WTF! Seriously, why muck with perfection? Iron Man was an outstanding film and the Nick Fury scene was a perfect setup, with a character who had even resembled Sam Jackson in the Marvel comics. So what happened? Jackson had a bit more to say on the matter, "There was a huge kind of negotiation that broke down. I don't know. Maybe I won't be Nick Fury. Maybe somebody else will be Nick Fury or maybe Nick Fury won't be in it. There seems to be an economic crisis in the Marvel Comics world so [they're saying to me], 'We're not making that deal.'" Didn't Marvel see the returns from Iron Man last year? Imagine what it will be now, with fans and general moviegoers already ready to see the sequel? especially if the sequel continues to land high caliber talent like Mickey Rourke, Sam Rockwell and Don Cheadle. Eventhough it now appears that Cheadle replaced Howard on the cheap for the role of Rhodes. Could it be, Marvel is doing the same thing with Nick Fury? Why? If this news turns out to be true, it is going to be a huge letdown.